Using iced coffee melt and pour soap in the shower is the perfect way to wake up hot day. Who doesn’t love a refreshing tall cup of iced coffee once summertime has arrived? Not to mention we have a great selection of coffee inspired fragrances oils. This tutorial is a bit advanced but can be done on a large scale fairly easily. Whether you use a loaf mold or individual cup molds, it is easy to customize this soap. For this soap, you can use either a loaf mold for a square cut bar. Or you can use a silicone cup mold for individual cup soaps. Prepare your “cinnamon sticks” using super clear soap and the soap curl method. Scent them with our chai fragrance and let these cure for one day. 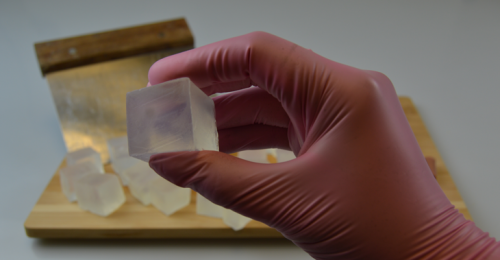 Cut up small blocks of clear soap, these will be the “ice cubes”. Let these cure for a day as well. Let the soap cubes and curls cure for one day. After a day has passed, melt super clear soap and add brown and iron oxide and a little bit of black iron oxide until it is a beautiful coffee color, then add a coffee fragrance. 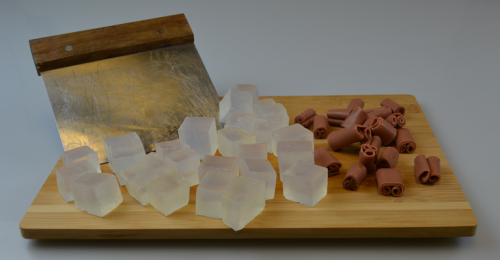 Add the “ice cubes” to your mold and spray them thoroughly with alcohol. Once the fragrance and color are well incorporated into the melted soap, pour the mixture over the clear soap chunks. Fill the molds until they are four-fifths full. Let the soap set for about 30 minutes, in the meantime melt white melt and pour soap and scent it with the same fragrance used for the coffee soap. After the top has cooled, but the inside of the soap is still liquid pour the white soap over the top. Just enough to barely break the surface. Swirl lightly if you have to. Then poke one of the cinnamon sticks on the top. And let the soap cool completely. Soap topped with whipped soap, glitter, and cinnamon. 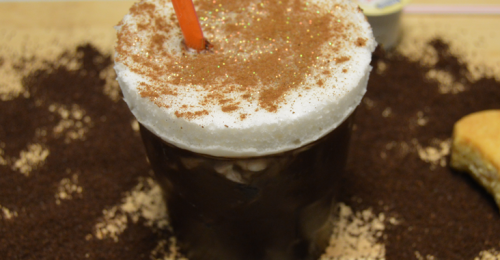 Optional* whip white scented soap for a “whipped cream” finish and sprinkle the top with cinnamon or cocoa powder. Drizzling the tops of the soap with melted clear soap colored dark brown will make the effect of a chocolate drizzle. 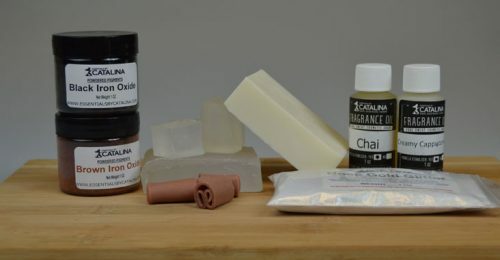 Make allot of soap “cinnamon sticks”, so you can have more than enough and you can use them for future soap.